This is one of the most infamous maps made featuring St. George's Caye presented in the Geography of Fishing in British Honduras and Adjacent Waters by Allan Craig in 1966. This is believed to be a map made by a Spanish spy. Why a spy? If you notice the spellings of the residents last names you will see that the more difficult Anglosaxon names are spelled wrong, and likely spelled out as they sounded by a Spaniard to the best of his ability. Further proof that a spy made this map is that the map originates in Madrid, from the Cartografia de Ultramar from 1780. Below you can see some of the misspellings of the names. It is possible too that some names used were first names, like Mr. Sam. Do you have any suggestions for these additional names from this 1764 map? 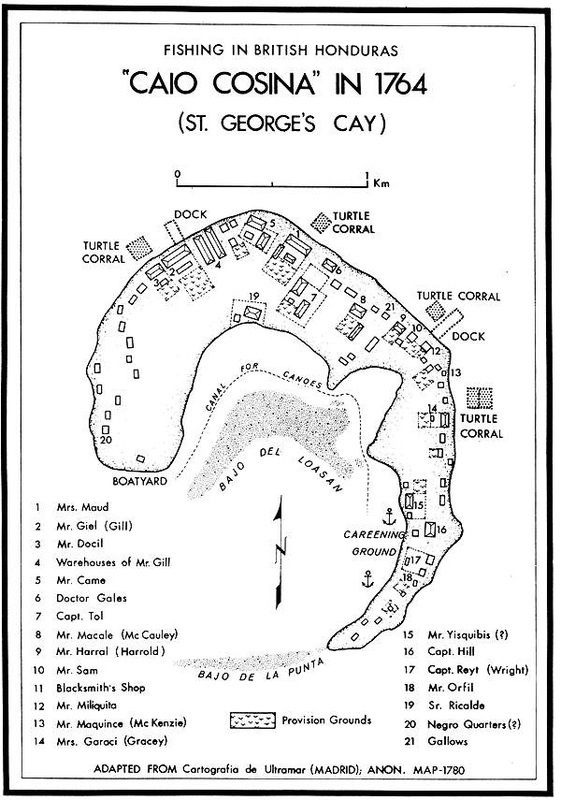 There are a lot of details from this map that gives us a glimpse into the life of the early settlers in Belize at St. George's Caye. Include a Bajo del Loasan and a Bajo de la Punta. Both areas are shallow and likely where St. George's Caye has now accumulated additional land by mangroves and associated plants colonizing the shallow bajos. There is a clearing defined channel for canoes directly behind the island and between the bajos, and also a careening ground where the large sailing ships that carried the logwood back to England were repaired while waiting for their next load. On the northwest point was the boatyard in what is today Fisherman Town. Buried beneath the accumulated debris in the back of St. George's Caye are likely untold treasures that will give us additional insight into the importance of this historical island. It is obvious that food was important to the settlers as well. Looking at the map you will notice that there are 4 locations where Turtle Corrals are identified. The enclosures at the end of the piers on St. George's Caye which we call crawls, originated as Turtle Corrals from the 1700s. 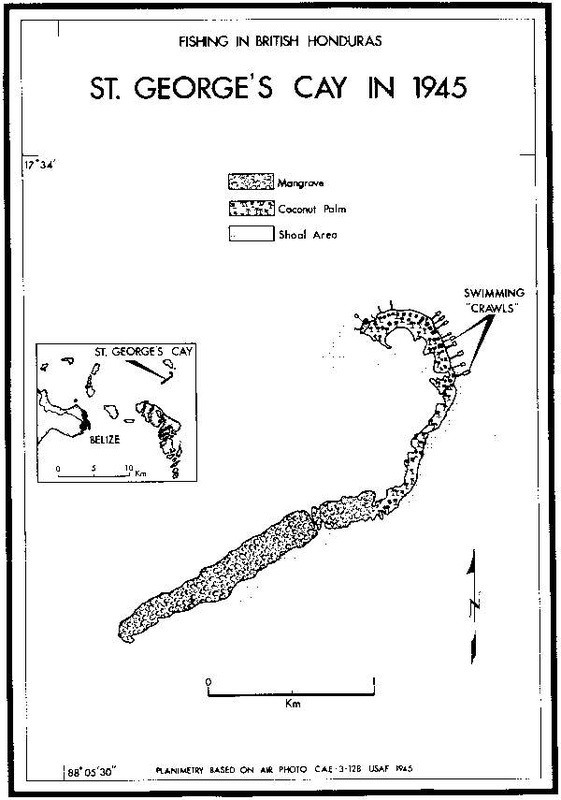 The presence of these turtle corrals at St. George's Caye in 1764 suggests that harvest of sea turtles was an important food source and likely Belize's first fishery export. Turtles would survive a month onboard the logwood ship's long voyage back to England and would provided a good source of protein for the the crew. You'll also see that behind many of the properties are "provision grounds." Growing fruits and vegetables would have been extremely important to the early settlers so they could become less dependent on provisions from the mainland and elsewhere. If you look further at the legend on the bottom of the map, you'll also notice that a "gallows" existed in 1764 on the island. Mr. Gill actually had warehouses in Fisherman Town, there was a Doctor Gales and a blacksmith. 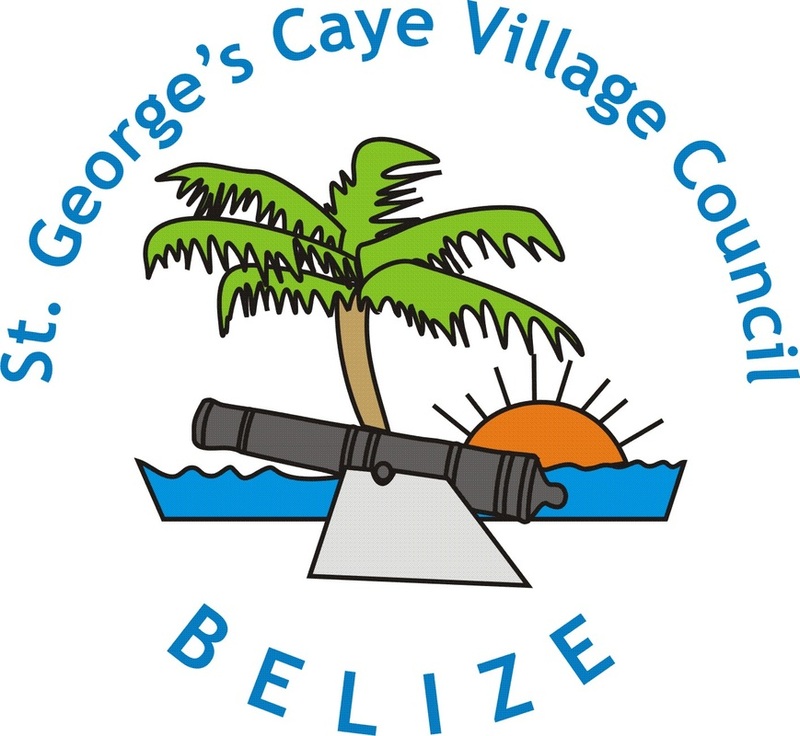 There were three captains and two women, Mrs Maud and Mrs. Gracey, identified as being landowners on St. George's Caye way back in 1764. What an amazing amount of information is available from one map! "Loasan refers to tropical plants of the Family Loasaceae. At this time, in the 1700-1800s, scientists were assigning plants and animals with Latin names and it is likely this was a general term for tropical plants." If anyone has additional translations for Loasan, please share! The book Fishing in British Honduras is a source of valuable historical information on Belize. Published within is a map produced from an aerial image that highlights mangroves, coconut palms, shoal areas (which are not clearly seen in this reproduction) buildings and swimming crawls. 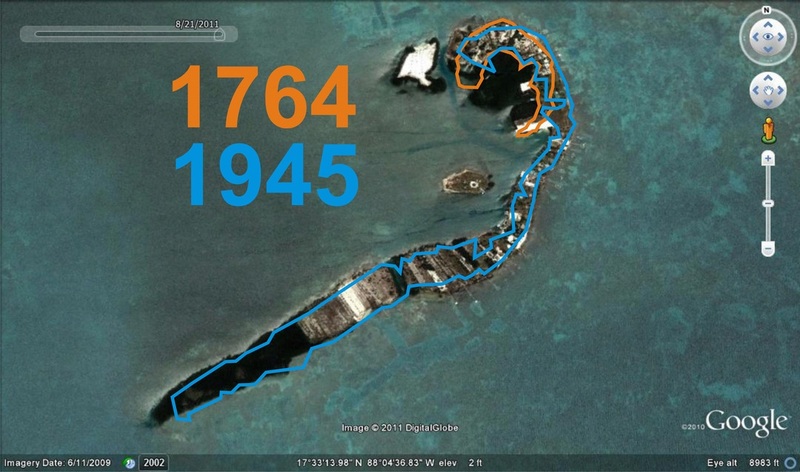 It is interesting to note that between 1764 and 1945 the Turtle Corrals became "swimming crawls" and that the island was not much more developed than it was in 1764. This was likely due to the 1931 Hurricane which came as a horrific surprise to residents destroying almost all homes and even worse, killing many of its residents. One of those killed was Heloise "Jim" Mason, a young girl who drowned after being trapped by a vat which fell over while the Pearce family and friends were sheltering from the hurricane behind it. 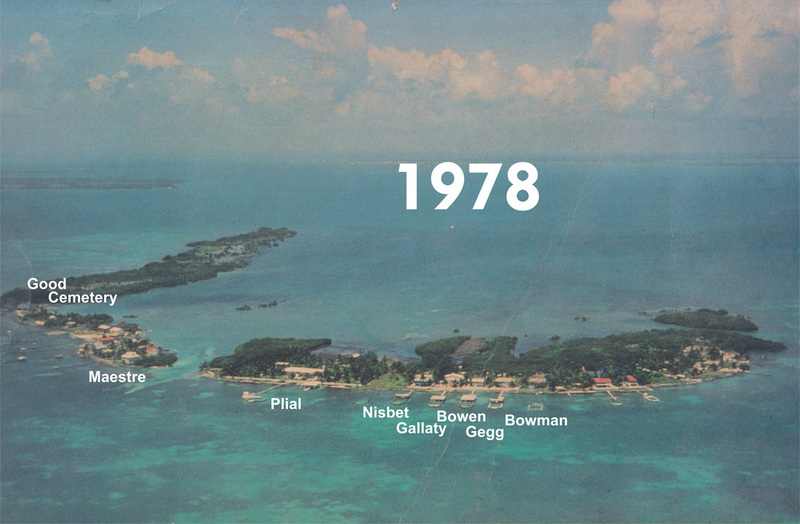 Overlaid on this aerial image of St. George's Caye are two outlines of maps, one from 1764 (in orange) which is on the back of the $5 dollar bill, and one from 1945 (in blue). Both outlines are imposed over the 2011 Google Earth image. There were likely many changes in the islands physical characteristics over the past 2 centuries that may come to light as the St. George's Caye Archaeology Project continues its investigations.